A man answers the phone and hears himself on the line, sick and struggling. Soon after, he dies unexpectedly. You thought about calling a friend, but never got around to it. He calls you back�your message is on his voice mail. You receive emails from a deceased friend. He predicts your injury weeks before it happens. Extraterrestrials send you computer messages with startling predictions. They all come true. Discover life-altering direct contact by phone, computer, TV, radio, letter, and other mediums. From whom? Entities, loved ones, extraterrestrials, and bizarre beings from the past or future. They take photos, deliver warnings, cause havoc, transcend time, and more. At times you can hear past and future events in progress. Sometimes messages are friendly and welcoming, such as Thomas Harden from the year 1521. Other times? Your worst nightmare. Join William Hall and Jimmy Petonito on a mission to unravel the mysterious world of impossible communication. You�ll hear from witnesses and experts on scientific and paranormal theories, examine evidence and case characteristics, and share real life paranormal messages of hope, terror, time slips, and wonder. Bonus author investigations are also included. 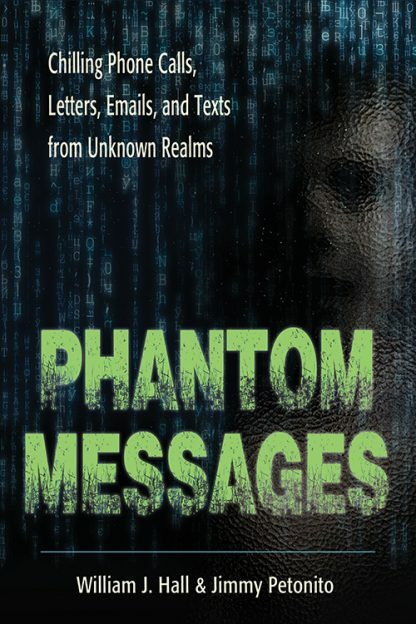 If you enjoy hauntings and UFO phenomena, you�ll love exploring the unforgettable Phantom Messages! Jimmy Petonito began investigating the paranormal with Ed and Lorraine Warren and has been exploring it for over 30 years. He has appeared on numerous television shows such as Sightings, Unsolved Mysteries, Primetime Live, and Hostage to the Devil, and his cases have been featured on shows such as Canada�s Scariest Night of My Life. Jimmy is also the host of the popular radio program The Haunted Chronicles. He resides with his two beautiful daughters in Connecticut.